Debunking the myth of lawsuit abuse. Any individual who has firsthand experience with the court system will tell you how costly and time-consuming it is to bring a lawsuit, and how difficult it is for the average American to get justice in court, especially if the defendant is a deep pocketed corporation. Yet, a disconcertingly large percentage of the public—influenced by fictional or highly misleading “frivolous lawsuit” stories and the occasional eye-popping verdict—believes the U.S. is in the midst of a litigation crisis. Any American who thinks they support tort reform ought to read Stephanie Mencimer's “Blocking the Courthouse Door: How the Republican Party and its Corporate Allies are Taking Away Your Right to Sue” (Free Press), a powerful new book which demonstrates how self-interested corporations and “lawsuit abuse” groups have convinced millions of citizens that it's too easy to sue. Why has their stealth campaign been so successful? Failure interviewed Mencimer to find out. What is the definition of tort reform? It depends on whom you ask. If you ask a trial lawyer he or she will say it's a movement to tilt the playing field in the courts towards the defense so that big companies are more insulated from lawsuits by individual consumers. If you talk to people in the corporate world they say that tort reform is a movement to bring fairness and predictability to a legal system that they consider nothing short of a form of legalized extortion. Are we in the midst of a litigation crisis? No. The kinds of lawsuits that the tort reformers care about are what you'd call personal injury cases or toxic torts. They make up a very small percentage of the legal docket—maybe 10 percent total. And the number of those lawsuits has been declining for at least a decade. So why do so many Americans support tort reform? If you ask Americans, “What is your definition of a frivolous lawsuit?” they basically think it is any lawsuit except one that they might file. You hear people who actually end up having to file say, “My suit wasn't frivolous. I'm not one of those people.” There's this perception that tort reform only limits the “crazy” lawsuits. People don't realize that tort reform affects their own ability to sue, and that's partly because it's sold that way by those who are most interested in passing it. Do Americans really want to go back to the early 20th century, where the public had almost no legal protection from unscrupulous businesses? I don't think so. Most people just don't think about this stuff. It's not like health care where you regularly see your doctor or have a regular interaction with the system. Most folks never have to deal with the legal system unless they are getting divorced. It's only after something really bad happens to them that they find out the rights they thought they had aren't there for them. How did we get to the point where Americans believe that our society is too litigious? For one thing, insurance companies and the tobacco industry spend a lot of money persuading them that is the case. Also, they circulate a lot of “loony lawsuit” stories. 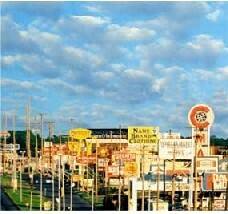 But when you look closely you find that these lawsuits are either not true or that the facts are remarkably different. And most of the loony lawsuits are filed—without the assistance of a lawyer—by prisoners or people who are mentally ill. It doesn't necessarily mean that the claims are frivolous. It's just that without the help of a lawyer they don't do it properly and that makes for things you can make fun of. So some goofy things get into the system, but most of them don't go anywhere. Can you tell our readers the story of Frank Cornelius? Back in the 1970s Cornelius worked as an insurance industry lobbyist in Indiana and helped pass the state's cap on medical malpractice damages. Afterwards, he left the insurance lobbying business and sold used cars—among other things. One day he felt out of a chair and injured his left knee. He needed [routine arthroscopic] surgery and after he got home from the hospital he was in an inordinate amount of pain. He tried to get hold of his surgeon, but the doctor was going on a ski trip and told Frank's wife, “Just get him a bedpan and I'll see him when I get back.” It turned out that he had a complication from the surgery [reflex sympathetic dystrophy, a chronic neurological syndrome often brought on by surgery or trauma], and at some point the condition became irreversible. Then while he was having physical therapy to treat this complication, his therapist shocked his leg with a piece of rehab equipment. After that he was in more pain than ever. Then he had to have more surgery because he developed a blood clot in the leg. After that operation he nearly bled to death, and as the surgeons were trying to save him the doctor who put the breathing tube in punctured his lung. By this time, he needed an oxygen tank to breathe, he was confined to a wheelchair, and was addicted to pain-killers. When he went to file a medical malpractice lawsuit, he found out the hard way that damages in Indiana were capped at $500,000. That was the most money he could be compensated, even after all these injuries. Cornelius ultimately committed suicide, but before he died he wrote a mea culpa to The New York Times about how the work he had done 15 or 20 years earlier had come back to haunt him. He was a victim of his own reform. Between his lost income and the cost of his medical care he had damages that were in excess of $5 million. He was only able to recover a tiny fraction of that. What role has the media played in building public support for tort reform? The fundamental problem is how news agencies cover the civil justice system. Most reporters never cover trials. They only cover verdicts. So the only time there is ever news about the civil justice system is when somebody wins a lot of money in a jury verdict. The public gets the perception that you could slip on a banana peel and win millions of dollars, because that's all they hear about. It's a very distorted portrait of the legal system. Does the mainstream media have an incentive to misrepresent the truth about the legal system? Some of the major media companies have done that, but there's really not that big of a conspiracy. Newspapers are understaffed and they just don't have enough bodies to sit in court all day and report on the civil side of things. So that's part of the problem. The other part is that reporters are often threatened with lawsuits, and some of them do get sued. Their firsthand experience with the civil justice system is often unpleasant. So a lot of reporters probably think that tort reform is a good idea. What can be done to get Americans to understand that lawsuits offer more than just the chance to obtain justice—they also provide the opportunity to shine a light on the behavior of private institutions? That's a good question. There's not really an organized constituency for the courts. You have the trial lawyers, but people tend to discount them because they have a financial motive. Anytime they try to come to the defense of the civil justice system, critics say, “Oh, they are just looking to line their own pockets.” So their message is a little bit colored by self-interest—even though their interests may align perfectly with the average citizen. There isn't really anybody else on their side except for a few consumer groups, but the consumer groups don't have any money. So it's a very uneven playing field. I don't really know the answer. I guess they could buy my book [laughs]. Is support for tort reform part of a larger overall problem—that Americans are increasingly willing to give up their constitutional rights? I don't believe they think much about it. It's funny because Americans have two minds about this. In our mythology we have this sense that the courts are this great place where David can best Goliath in the courtroom. People still believe that. And they think it's important. But at the same time they don't fully understand that these [tort reform] measures minimize that possibility. Everyone has heard about the McDonald's coffee spill lawsuit. 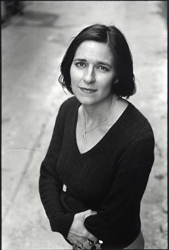 What do people not know about Stella Liebeck's story? It's so hard to sum up what really happened in that case in two sentences or less. The headline was, “Old Woman Spills Coffee on Herself, Wins $3 Million!” People think, coffee is supposed to be hot—ha ha ha. But what people didn't hear is that the behavior of McDonald's was rather callous. McDonald's knew a lot of people had been badly burned by their coffee and still refused to turn the temperature down. First, you need to know that Stella wasn't driving when she was drinking the coffee, and when it spilled on her, she went into shock and ended up with third-degree burns on the inside of her thighs and other places you would not want to spill hot coffee on. She had to have skin grafts and spent a couple weeks in the hospital. Her daughter had to almost quit her job to take care of her because the health insurance money ran out and she had to be released from the hospital [early]. Stella sent a letter to McDonald's, telling them that their coffee was too hot and to turn the temperature down, and also asking them to pay some of her medical bills. McDonald's sent her a letter back and said, Sorry, you are out of luck. We are not going to change our coffee temperature and we'll give you $700 to go away. Stella and her family members were longtime Republicans but she was so outraged that she consulted an attorney. She ended up suing and the case went to a mediator. The mediator suggested that McDonald's settle the case for approximately $225,000, but McDonald's refused and forced the case to go to trial. [After-the-fact] interviews with the jurors show that the jury was very skeptical of the case from the very beginning. But the evidence showed that there were something like seven or eight hundred complaints that McDonald's had received about coffee temperature, with witnesses from Shriners Burn Center testifying that McDonald's coffee was being sold at a temperature hot enough to peel skin off bone in seven seconds or less. Jurors were shocked and awarded Liebeck actual damages—compensation for her losses, medical bills, and her daughter's lost wages. The jury did dock Stella twenty percent, because she did, in fact, spill the coffee. Then they awarded $2.3 million in punitive damages to punish McDonald's for its conduct—approximately two days worth of McDonalds' profits from coffee sales. What never got the headlines, of course, was that the judge reduced the award to approximately $400,000. The case was eventually settled for something less than that a few years later. So Stella did not get $3 million for spilling coffee on herself. In researching your book did you encounter any evidence to support the notion that lawsuits drive up the cost of medical malpractice insurance? No. In theory lawsuits could drive up the cost of insurance, but in medical malpractice the insurers don't make their money off of premiums, they make it off of investments. They take the premiums and invest them in the bond and stock market. There's not much evidence that medical malpractice rates went up because of an epidemic of lawsuits. The spike was caused by the collapse of Enron and WorldCom, because [insurance] companies lost money on stocks, like most of the rest of the country. 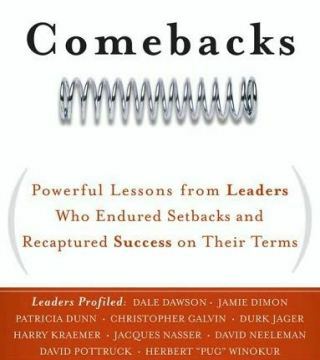 Comebacks—Lessons from leaders who endured setbacks and recaptured success on their terms. 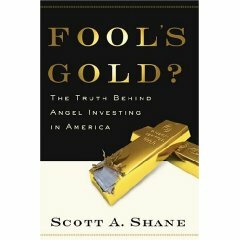 Fool’s Gold?—Debunking the myths of angel investing. 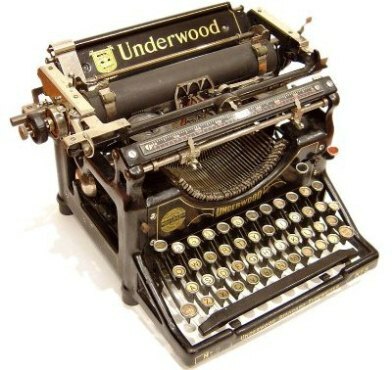 Soft Return—Keyed by young enthusiasts, the typewriter makes a minor comeback.